The Association maintains an apiary at an organic farm in North Shropshire. We hold regular meetings at the apiary during the summer, where members new and old can gain experience in handling bees and learn from each other in an relaxed and friendly atmosphere. The apiary was re-sited during 2008 and is being developed to include a number of different types of hive so members can examine the pros and cons of the various types before investing in equipment. 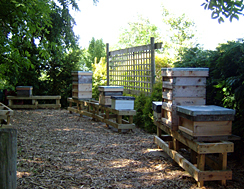 In 2010 we received grant funding to further upgrade the facilities at the apiary. An additional storage shed is currently being planned and is expected to be in place for the 2017/18 season.